"The DM307 is an extremely versatile groove making powerhouse. The range of this instrument amazed me. From out-of-box killer grooves to being able to meticulously craft your own by using their new GRID and LOOP MUTATOR features. With an enormous library of sounds and the ability to tweak, the DM307 is a welcomed addition to my sound and style of writing." "Very cool presets and sounds. It´s great for creating loops from another approach. I seriously dig the drum and hi-hat banks. Good stuff!!" "Really powerful as well as clean. What I also like is that it doesn´t sound "digital" like many other plugins. I was astonished by the ease of use and amount of possibilities. Haven´t seen anything like this in a while!" "DM-307 took me by surprise. I wasn´t sure what to expect but after experiencing what this library has to offer it has found a unique home in my studio. I´ve always lamented the shortage of good percussive libraries that sound great and feel great. Between DM-307, Damage, and Aeon, Heavyocity has brought composers´ libraries that elevate our work and inspire creativity." "There are so many interesting sounds in the DM-307 that I plan to use. I found there to be a lot of really nice dark percussion and cool hi hats. Very dark-techy....and also a little bit electro!" "I´m loving the DM-307, it´s got that signature Heavyocity attitude, rock solid timing and an incredible variety of ultra-tweakable sounds. The GUI is among the best I´ve ever used in a Kontakt instrument. It´s is an amazing drum tool that has instantly jumped to the top of my go-to list." "The sound of the DM-307 is awesome! You don´t need to add tons of plugins to get it to sound good. The sounds are ready to use in your productions." "DM-307 has a great deeply customizable interface to create the rhythm, energy and motion I need for my scores. I look forward to digging in to yet another sonic feat from Heavyocity." "DM-307 is yet another home run for the boys at Heavyocity. It offers the user the chance to create unique and fresh drum loops & sounds with maximum flexibility and is a joy to use. It´s a keeper without doubt!" "We are already using DM-307 on every new cue we´re scoring on ´Almost Human´! We know we´re just scratching the surface on what seems to be an infinitely limitless production tool! The sounds and flexibility are amazing!" "Hands down, my new number one go-to for any drum/percussion sound. What really impresses me every time I open it is the meticulously designed interface. It makes everything quick and easy, but the power and control you have over the sounds is truly amazing. Having so much control inside the instrument itself is saving me time and processing power - two things we can always use more of!" 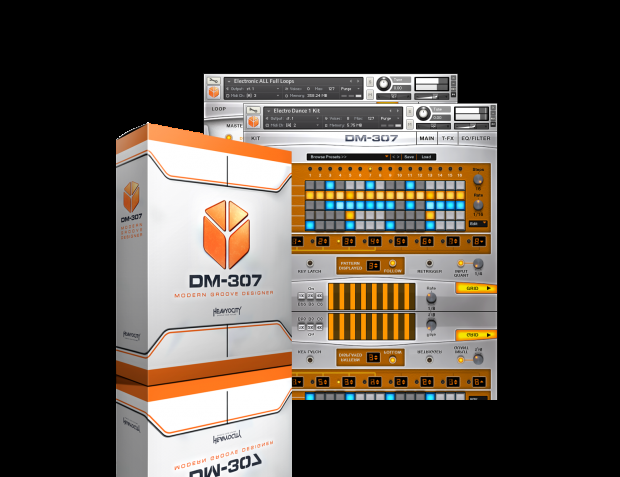 The DM-307 Modern Groove Designer is a highly stylized collection of modular synth drums, live percussion and processed classic analog drum machines. Created by New York City’s renowned sound design team, this new virtual instrument introduces innovative ways to quickly and easily create production-ready grooves and beats in a variety of contemporary musical styles; including electronic, hip hop, industrial, ethnic and cinematic. As the successor to Heavyocity´s award-winning Evolve, DAMAGE and AEON Collection virtual instruments, DM-307 was developed through inventive recording, sound design and synthesis techniques. DM-307 offers 3600+ samples weighing in at 7+ GB of source material. Mit dem DM-307 ist Heavyocity wieder einmal ein großartiges Produkt gelungen. Die Qualität der Samples ist überragend, und die kreativen Möglichkeiten schier unendlich. Hier macht das Arbeiten mit vorgefertigten Loops oder selbstgestalteten Rhythmen gleichermaßen Spaß und ermöglicht einen schnellen Zugang zu aktuellen Sounds und Produktionstechniken. Klanglich wissen sowohl das beigelegte Audiomaterial als auch die Bearbeitungsstufen des DM-307 voll zu überzeugen. Die Oberfläche ist trotz der vergleichsweise komplexen Instrumenten intuitiv, die Bedienung gestaltet sich dementsprechend einfach. Das Hauptaugenmerk des DM-307 liegt auf elektronischen Musikstilen, zum Beispiel House oder Dubstep. Aber auch für Ambient- Produktionen lassen sich höchst interessante Klänge kreieren. Mit dem DM-307 bringt Heavyocity wieder einmal ein absolutes Spitzenprodukt auf den Markt. Frische neue Sounds und Effektklänge aus verschiedenen Bereichen bekommt man hier in sehr guter Qualität geliefert. Dank des neuen Stepsequencers kann man alle Sounds direkt im DM-307 programmieren, bearbeiten und mit Effekten versehen. Die vorgefertigten Loops bieten viel Abwechslung und lassen sich entweder komplett oder in einzelnen Teilen abspielen. Für all diejenigen, die öfter mal ein paar härtere Sounds brauchen, genau das richtige neue Klangfutter. Da bleibt nur die Gesamtnote 1. "The DM-307 can perhaps seem a tad bit expensive at $299, but once you get stuck into it, you can see its totally justified. Its a massive percussion instrument that is capable of pumping out rhythms in a wide range of genres – from EDM and Industrial to Rock and Ethic madness. If you already own Damage and you’re looking for something in the same style, but with more flexible and a grittier sound, DM-307 is for you. If you only write jazz flute solos, this bad boy is not for you." The new Heavyocities product DM–307 is by far one of the best drum machines made for Kontakt and Kontakt player and all though the price might be a bit steep it is a right choice for any composer or EDM producer if one preffers Kontakt to other software based drum machines! "DM-307 more than meets the levels of excellence we've come to expect from Heavyocity, and may well prove to be the company's finest and most flexible library to date." Erster EIndruck : Spannende Sounds, vielfältig, modern, sehr gute Bearbeitungsmöglichkeiten, erschliesst sich praktisch ohne Bedienungsanleitung.